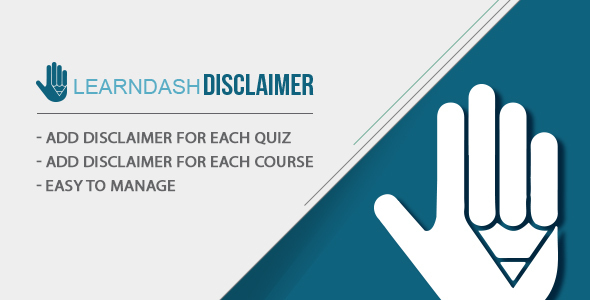 Learndash disclaimer plugin is an WordPress plugin that allows the creation of Terms & Conditions​ ​or​ ​Disclaimer​ ​popup​ ​windows​ ​for​ ​your​ ​Learndash​ ​course​ ​or​ ​quiz. You can create a single popuptoappearacrossyourentiresite,assignittospecificcourse or​ ​quiz. Disclaimer plugin is used in websites where visitors are required to agree to disclaimer conditions​ ​before​ ​taking​ ​course/quiz. The​ ​popups​ ​you​ ​create​ ​can​ ​be​ ​easily​ ​created​ ​to​ ​control​ ​popup​ ​message. Hide/Enable​ ​the​ ​disclaimer​ ​popup​ ​to​ ​be​ ​visible​ ​per​ ​course/quiz. User​ ​must​ ​confirm​ ​disclaimer​ ​agreement​ ​to​ ​proceed​ ​for​ ​course​ ​or​ ​quiz. Must​ ​install​ ​Learndash​ ​plugin​ ​as​ ​prerequisite. Popup​ ​works​ ​with​ ​the​ ​following​ ​Course​ ​types​ ​only​ ​(Free​ ​–​ ​Recurring​ ​-​ ​Buy​ ​Now).